Zeigen Sie Ihre Unterstützung auf Social Media! Mit der "jüngsten Community der Wikimedianer" und meisten Treffen der Wikimedianer in die Welt, Hongkong ist eine Stadt mit multiplen Persönlichkeiten, aufgrund beiden kantonesisch Wurzeln und die jüngsten britischen Einfluss. Es ist auch ein wichtiger Knotenpunkt in Ostasien mit weltweiten Verbindungen zu vielen der Weltstädte, die Wikimedianer aus der übrigen Welt um über die Region und seine feine Küche wissen können, und Wikimedianer in Asien um mehr über die globale Bewegung selbst wissen. Hongkong (Englisch: Hong Kong; Chinesisch: 香港), oft abgekürzt HK oder HKG, ist einer Stadtstaat und eine von zwei Sonderverwaltungszonen der Volksrepublik China. Die Stadt liegt an der Südküste der China, zeigt das östliche Ende der Perlflussdelta, und herzt südwärts das Südchinesische Meer und ostwärts den Pazifik. Ingesamt 1104km2 Landfläche, hat Hongkong 7 Millionen Einwohner, damit macht Hongkong eine der Städte mit höchsten Bevölkerungsdichten. During the colonial era, the territory espoused minimum government intervention from the British authorities and sheltered immigrants from different parts of the world. The resulting culture, often described as "East meets West", preserves many Chinese traditions; different religions and ethnic groups coexist in it peacefully. The British legal framework and the government's positive non-interventionism economic policy led Hong Kong to become one of the world's leading international financial centres, as well as a hub for regional transport and a famous tourist destination. Originally a fishing village on the edge of the Chinese Empire, the territory was changed forever when it became a crown colony of the British Empire as a results of the First Opium War. The stability, security, and predictability of British law and government enabled Hong Kong to flourish as a centre for international trade. This attracted people from all over the world to come and stay in Hong Kong, and bring in their own culture, religion and cuisine. About 95% of the people of Hong Kong are of Chinese descent, and the remaining 5% includes Indians, Pakistanis, Nepalese, and Vietnamese; there are Europeans, Americans, Canadians, Japanese, and Koreans who mostly work in the city's commercial and financial sector; an estimated 252,500 foreign domestic helpers from Indonesia and the Philippines working in Hong Kong as at 2008. There is a high degree of religious tolerance in the territory. The main religions are Buddhism, Taoism, Confucianism, and Christianity; Christians are nearly equally divided between Catholics and Protestants. Also Sikh, Muslim, Jewish, Hindu and Bahá'í communities coexist peacefully with each other other religions. Minimal government intervention from the British authorities to the Chinese communities allowed Chinese paganism and traditional Chinese customs to remain preserved among both indigenous residents of the New Territories, and immigrants from different parts of China. Some of these traditions can be observed especially during traditional Chinese festivals such as Mid-Autumn Festival and Duanwu, during which various celebrations and associated activities take place across the districts of the city. Kwai Tsing Container Terminal, which stood as one of the three largest ports in Asia in the past few decades. Logistics and trading have always been tightly bound to the history of Hong Kong since its foundation. Indeed, the original aim of establishing colonial Hong Kong was to build an entrepôt between the British Empire and the rest of oriental Asian countries, primarily the Mainland China during the 19th century. The birth of Hong Kong was a by-product of international trade, and the city's survival and growth remains inevitably bound with and influenced by its importance in international commerce. The Rose Garden Project, announced in 1989, effected the construction of the new Hong Kong International Airport and its associated transport infrastructure. Regarded as an architectural magnificence of the 20th century and whose lasted for 8 years of construction, the new Hong Kong International Airport, known locally as 'Chek Lap Kok Airport', opened on 6 July 1998. In modern standard of construction laid a foundation stone for a new era of aviation in Hong Kong, with much higher developing potential and handling ability compared with the previous Kai Tak Airport, which was infamous for its spectacular urban landings. The city has a large proportion of countryside nature reserves despite its population density. Plover Cove Country Park is one of the example. Hong Kong is much more than a harbour city. The traveller weary of its crowded streets may be tempted to describe it as "Hong Kongcrete". Downtown possesses many features where Chinese and Western culture, modern and ancient custom are blended together. From colonial style to ancient temple, old buildings are actually scattered among the skyscrapers which dominate the skyline. These buildings, together with the world famous Victoria Harbour, form the unique landscape of downtown Hong Kong. Yet, this territory with its cloudy mountains and rocky islands is mostly a rural landscape. Much of the countryside, amounting to 40% of Hong Kong's land mass, is classified as Country Park. Although it is impossible to completely escape a population of 7 million, it is easy to find pockets of wilderness that will reward the more intrepid tourist, especially places scenic countryside viewpoints which offer a skyline panorama of downtown Hong Kong. For the trailwalker, there are the well-known MacLehose Trail and Wilson Trail. Also, you are never far from the sea in Hong Kong and going to a good beach is always only a bus-ride away. Chinese culture is something worth exploring in Hong Kong. From the crowded street markets to the rural indigenous villages in the New Territories, Cantonese gourmet, Cantonese opera and Buddhism, Taoism, and Confucianism all in the same temple, Hong Kong features the best preserved Chinese and Cantonese culture in the region, a result of the lack of political turbulence in the city's history. Hong Kong is renowned as a world gourmet paradise. Owing to both British and Chinese influence, all kinds of cuisine are available in the city. Kowloon City, in particular, boasts a plethora of restaurants as a result of its proximity to the now-disused Kai Tak Airport. Although restaurants in general do not have the facility to serve food in conformity with religious standards such as halal and kosher, there are specialist halal and kosher restaurants in several parts of the city, especially in areas where South Asians and Islamic communities live and congregate. As Hong Kong is a coastal city and with a long history of fishing activity, seafood is indeed a ubiquitous ingredient in most Cantonese restaurants in the city. From a simple and common local seafood restaurants, to the luxuries such as Jumbo Floating Restaurant or those seafood cuisine specialists in Sai Kung, its the ingredient that captivates chefs and diners alike. Besides traditional Cantonese food which is served in every corner of the city, it is also easy to find restaurants which serve other types of authentic, exotic cuisine, such as those other regions of the Mainland China and Taiwan, Japanese, Korean, Thai, Vietnamese and others, thanks to immigrants of various ethnicities over the past decades and the food-savviness of the Hong Kong people. On the other hand, western and international cuisine is just as easily available if you prefer them. Steakhouses, bars, and classical cuisine from various parts of Europe come in various types and classes; modern fusion restaurants offer the best of both worlds; even the elegance of British afternoon tea is available within this broad spectrum of choices. No matter what makes your meal during your stay, a visit to a "Cha Chaan Teng" is a must-try experience for those who want to understand the most iconic cuisine of Hong Kong, because it originated from the fusion and combination of traditional cuisines into a simple, cheap, one-stop everyday meal for every Hong Konger. Try an ice-cold milk tea or red bean ice, served together with some Hong Kong-specific bakery delicacies such as egg tarts and pineapple buns for a snack, or at lunch or tea time. If you are really struggling to find out whether there's one to match your tastes, there is a popular local search engine and dining guide to help you find your poison. Hong Kong has been consistently reputed as one of the safest metropolitan areas around the world in the past few decades. This achievement owes not only to good natural factors such as the absence of threat from large-scale natural disasters such as earthquakes, but also more importantly to the effort and efficiency of the civil security services. Compared to many million-strong cities which are criticised for their safety record and where local travel presents many dangers to visitors, Hong Kong is a city where safety is a top priority guaranteed by its trustworthy civil security services. In case of emergency or threats thereof, police stations, or police officers on patrol, may be found easily and are always willing to provide assistance. Emergency responses are also quick and emergency services are dispatched to the scene within a few minutes. The Hong Kong Police Force is the world's second, and Asia's first, police agency to operate a modern policing system. With long history and efficient management, today it is one of the most efficient and clean policing force around the world. Because of them, Hong Kong has one of the lowest common crime-rates among cities with comparable populations worldwide. Emergency aid and rescue service in Hong Kong are at a world-class standard, with a service agreement which promises that an ambulance will arrive on the scene within 8 minutes of an a emergency call; the Fire Service is also praised for its efficient and quality performance in responding to accidents and disasters. The climate of Hong Kong is a monsoon-influenced humid subtropical climate (Köppen climate classification Cwa), just short of being a tropical wet-and-dry climate. As with other subtropical areas, Hong Kong has long summers and winters, and comparatively short springs and autumns. In the winter, temperatures hover between 15 °C and 20 °C. However, northeast winter monsoons bring frequent cold fronts which can cause the temperature to dip below 10 °C, despite Hong Kong's tropical latitude and coastal location. Conversely, warm maritime airstreams also commonly raise the temperature well above 20 °C; temperatures as high as 29 °C have been recorded in February. Winter starts sunny in December and becomes cloudier towards February. Spring brings warmer and more humid weather. There is a sharp increase in rainfall around April. Spring is the cloudiest season of the year, with March and April both averaging only around 100 hours of bright sunshine. Summer weather is hot, humid and unstable. Although usually sunny, thunderstorms and scattered showers are common. August has the highest average rainfall in the year. Temperatures usually exceed 30 °C during the day, which, coupled with a high humidity, can result in an extreme heat index. Extreme heat indices are also caused by continuous sunshine and low breeze, usually long-lasting around July and August, as a result of subtropical high pressure areas. This also occurs before typhoons hitting Hong Kong or nearby regions in the northeast, e.g. Taiwan or the Eastern Coast of China. Such outbound airstream brings even hotter weather, in addition to dirtier air. Nights are also warm with an average minimum temperature of 26 °C. Hong Kong is frequently hit by typhoons in the summer. Autumn is generally considered the most pleasant season. Temperatures are still high (20–27 °C) but humidity and rainfall are considerably lower. Autumn is also the sunniest season in Hong Kong, with October and November both averaging close to 200 hours of bright sunshine. Hong Kong has one of the strongest Wikimedian communities in the Asia-Pacific region. We organized the Chinese Wikimedia Conference 2006, the first ever regional Wikimedia conference. Wikimedia Hong Kong, the local chapter of the Wikimedia Foundation, was founded in 2007, and was among the earliest Wikimedia chapters to receive charity status. The first Wikipedian meetup in Hong Kong was held in 2005. Since then, Wikimedians in Hong Kong have been meeting regularly. By the end of 2011, we have organized a total of 60 meet-ups, more than anywhere else in the world. Among the Wikimedian community, Hong Kong is best known for its youthful Wikimedians. According to Jimmy Wales during his visit to Hong Kong in 2006, Hong Kong has the "youngest Wikimedian community" in the whole world in terms of participants' age. If you are in the area and interested in helping, please e-mail us at wikimania wikimedia.hk . If you are not available to help in person, you are still welcome to show your support everywhere you like, on your user page, and more important is on social media! After considering and approaching various possible venues, we've selected the Hong Kong Polytechnic University (PolyU) as our proposed conference venue. The university is located in the Hung Hom area of Kowloon Peninsula, neighbouring the Hung Hom transportation hub which comprises Hung Hom Station and Cross-Harbour Tunnel. PolyU was founded in 1937 as a technical college, formally established in 1972 as a higher education college with degree-course education, and granted university status in November 1994. Today, PolyU has about 28,000 students reading 130 postgraduate, undergraduate and sub-degree programmes in various disciplines, including design, engineering, fashion and textiles, medical laboratory science, physiotherapy and radiography. In recent years, the university achieved great academic triumphs in the field of computer sciences and technology among the Asia-Pacific and Greater China regions, and strives to contribute more to the information technology industry of the region. The details of the available facilities are still under negoatiation. We hope to host the main conference in the Jockey Club Auditorium inside the main campus, which has 1,084 seats on its balcony and main hall. We also intend to host the associated activities and sessions within the university. The university management have extensive experience in organizing similar activities and is a popular venue provider in the locality. The Jockey Club Auditorium is one of the main auditoria managed by the university. It is capable of hosting a variety of functions including public talks, ceremonies, conferences, seminars and even the performing arts. The auditorium is configured as a balcony-included theatre layout with 702 fixed seats on the main floor and 323 balcony seats, with additional temporary seats available on request. The auditorium also contains a main entrance foyer right above its main hall level, which is ideal for setting-up exhibition stands and providing an reception area for the conference. Apart from the grand opening, we also intend to arrange sessions in the main auditorium catering for large number of guests expected at the conference. PolyU also provides many seminar classrooms of 30–100 seats each suitable for smaller seminars and interactive group sessions of Wikimania, and for local Wikimania administration. Lecture theatres of various capacities are also available, mostly 80–160 seats, with a few being larger than 160 seats where we will hold smaller focussed public talk sessions during the conference. Apart from public sessions, we also expect that many attending organizations, in particular local chapters, firms and the media, will be active throughout the duration of the conference. We will therefore reserve extra seminar rooms and reconfigure them as on-site workspace adapted to the needs of the attending organizations, such as conducting interviews, press activity, administrative work, and other backstage needs. The auditorium has an open-air amphitheatre area outside its entrance foyer, and we intend to configure this area into a combination of open-space seating, public exhibition and related activities. The amphitheatre has an area of about 1,100m² and can accommodate 200 spectators, ideal for informal gatherings. Other than the open-air amphitheatre, the University can also arrange covered areas on the podium nearby the Auditorium to be available for catering and other purposes. The team is well-connected with the University. The team is currently working with M-lab under the School of Design of the University, consulting the relevant management personel about the availability of the Main Hall and other rooms, and we can place our booking through M-Lab. Through our partner DotAsia, we can also reach the management of the University, and get further support to use different facilities of the university. With the help from M-lab, we will try to negotiate with the University management to get a discounted price or even waived rent for such facilities. The main auditorium is equipped with a full-set of theatre-standard conference equipments, including built-in cinematic projection and audition system, standard modern stage fly system and lighting facilities. Seminar rooms are equipped with overhead and LED projectors with screens and audio system, making them ideal for presentations and discussions. Furthermore, the lecture theatres are equipped with VHS and DVD players, and slide projector, in addition to the standard classroom facilities. Wired and wireless microphones are also provided on-site within the theatres. We believe that the flexibility and variety of available room sizes will meet the various desires of the presenters and attendees of each session. Although firm booking of the rooms for our proposed dates of Wikimania 2013 will only be available from December 2012 onwards, once our bid is successful we will negotiate with the University management to make our bookings a top priority, and ensure that plenty of rooms will be available during the conference. The whole university campus is covered by a built-in WLAN Wi-Fi system which is operated by the university. We will seek for a sponsorship from local telecoms companies, to provide extra bandwidth and routers for parts the venue and accommodation where existing infrastructure is inadequate. Overview map of PolyU with surrounding area of Tsim Sha Tsui. Details of selected locations may be referenced from further sections of the article. The university is located right next to MTR Hung Hom Station and the Cross-Harbour Tunnel Bus interchange and the main entrance is accessed by several footbridges connecting the university campus with the station and the bus interchange. MTR Hung Hom stations is served by the East Rail Line and West Rail Line, two mainstream suburban railway routes of the city. The bus interchange is served by virtually all bus using the Cross Harbour Tunnel (buses with a 1-prefix on their number, e.g 101,104,107,118). Any other bus routes which call at Hung Hom Station terminus are also accessible to the university from a walking distance. Additionally Citybus Cityflyer route A21 terminates at Hung Hom MTR station therefore the campus is virtually also accessible directly by airport buses. The vehicular entrance to the university, and an alternative pedestrian entrance of the campus is located at the Austin Road junction with Cheong Wan Road right opposite with Hong Kong Museum of History. The venue is 10 to 15 minutes walking distance from Nathan Road or Tsim Sha Tsui. We are also looking for a venue in the most famous hang-out of the town, Lan Kwai Fong in Central, Hong Kong Island, to have a welcoming party, for those who will come to the pre-conference. We are currently planning to have a decent Cantonese-style lunch reception in a hotel in Tsim Sha Tsui East, nearby the venue. The proposed venue, Siu Lam Barbecue By The Beach, boasts long-standing experience of hosting large-scale social events for organizations, and has a capacity of 3000 attendees. Situated on the shore of Castle Peak Bay, otherwise known as the Hong Kong's "Gold Coast", the venue offers a sandy beach perfect for swimming and sun-bathing in the summer sunset, in addition to the obvious: a barbecue buffet dinner for all attendees. The venue operates traditional Hong Kong-style barbecue (en, zh). Unlike Western barbecues where a chef cooks meat and vegetables for everyone on a grill, in a Hong Kong-style barbecue everyone sits around an open charcoal fire, and cook their food using long barbecue forks. The environment is described as being "more similar to a fondue or campfire than a barbecue", and provides an ideal opportunity for socializing, or even wiki-style collaboration on cooking! A buffet barbecue is provided, which means unlimited amounts of uncooked food is supplied centrally. From there everyone collects raw food as they desire, and cooks them on their own fire. Coaches will be arranged to transport attendees between the conference venue and the party venue immediately after the end of the main conference. We aim to arrive at the beach with ample time to spare before sunset. After the party, coaches will take attendees from Siu Lam to the conference venue and accommodation. Location of the proposed party venue for references. Air travel: Hong Kong International Airport (IATA: HKG) is a leading air passenger gateway and logistics hub in Asia. Located on the island of Chek Lap Kok, 34 km/21 miles from downtown, HKG airport has scheduled non-stop flights to more than 150 cities. Regarded as a focus city or major transfer hub by major airlines, 85 airlines operate from the two-terminal airport; it is the primary hub of Cathay Pacific, Dragonair, Air Hong Kong, Hong Kong Airlines, and Hong Kong Express. Since 2001, the airport has been named the World’s Best Airport eight times in the annual passenger survey by Skytrax. 'Local' carriers, Cathay Pacific and Dragonair, were also rated by Skytrax the Best Airline of Year 2003, 2005 and 2009 and the Best Airline of Greater China region respectively. The airport itself operates in 24 hours, 7 days a week. Hong Kong International Airport is connected to the city by the MTR Airport Express train service; it reaches both Kowloon Peninsula and Hong Kong Island. Hong Kong Station is the terminus of the route and also of a number of local bus services. Both Hong Kong Station and Kowloon Station provide several feeder bus services between the station and various hotels of the city exclusively for Airport Express passengers only. There is also an extensive Airport bus network served by both Citybus and Long Win Bus. These lines are represented as a A- or E-prefix in front of their bus routes, and the bus network may reach to most urban areas covering Hong Kong Island, Kowloon, and most towns in New Territories. However, the East Rail Line, one of the metro lines inside the Hong Kong's Metro network (MTR) also connects to two of the boundary control points – Lok Ma Chau and Lo Wu. Both these stations provide accessibility towards Shenzhen, and an interchange with the Shenzhen Metro on the Chinese side of the border. A journey from the border towards Hung Hom Station takes approximately 40 minutes. Additionally Lo Wu Station is interchangeable with the Shenzhen Station of CRH intercity train network of the Mainland China across the border, which runs a more frequent services between Shenzhen and Guangzhou. and these two ferry terminals are accessible with MTR and local buses services. Notwithstanding their names, both of terminals provide extensive network of ferry services towards Macau and various cities within Guangdong Province. However services from China Ferry Terminal are more frequent and network towards China extensive than its counterpart, while only Macau Ferry Terminal provides a 24 hours ferry services towards Macau. Some ferry routes, from/to either Macau or Shenzhen, terminate at Hong Kong International Airport. These are only available at the Skypier, accessible from the departure hall of the airport (as for flight transfers. Cruise ships also serve Hong Kong. The cruise terminal of Hong Kong – Ocean Terminal – is located at Tsim Sha Tsui on the Kowloon Peninsula. Land: Hong Kong has convenient cross-border bus services to many cities in Guangdong province including Shenzhen, Guangzhou and Dongguan. Tickets are purchasable either in mainland China or Hong Kong, services and operators vary depending on the exact location and destination of travel. Road connections across boundary check-points are possible and vehicles with specialised licenses are allowed across the border. Several check-points connect with the expressway network of Hong Kong including Lok Ma Chau-Huanggang and Shenzhen Bay Port. Additionally most cross-border buses use these two particular ports on their journey. Hong Kong ist eines der dominierenden Regionalen Knotenpunkn in Asien-Pazifik mit zahlreichen Fluggesellschaften bieten Linienflüge von und nach der Stadt. Die folgende Tabelle zeigt eine Auswahl an Zielen und Luftfahrtunternehmen mit den ihnen zugeordneten Tarife. Der Fahrpreis ist mit einem Abreisedatum in 7 August 2012 vom Ursprung Flughafen verwiesen, mit einem Hin-und Rückfahrt verlässt Hongkong am 12. August 2012. 'inkl. Steuern & Gebühren, Gepäck und andere Leistungen müssen extra bezahlt werden. Hong Kong ist ein äußerst freundliches Territorium in der Welt zur Visumpflicht. Staatsangehörige aus über 170 Ländern und Territorien, darunter die meisten europäischen und amerikanischen Staaten sowie britischen Commonwealth-Staaten, kann Hongkong visafreien besuchen über einen Zeitraum von 7 Tagen auf 180 Tage. Nicht für Inhabern von urugayischen Reisepässen, die in Kraft des Erlasses 289/90 ausgestellt wurden. Nur für Inhaber "Taiwan Compatriot Entry Permit"
Nur für Inhaber biometrischer Pässe. Nur für Inhaber biometrischer Pässe, sofern diese nicht von der serbischen Koordinierungsdirektion (Serbisch: Koordinaciona uprava) ausgestellt wurden. Chinese nationals with a hukou (or family registration) in Mainland China are required to obtain an exit permit from the Public Security Bureau for any type of visit to Hong Kong (short visits and long visits alike, including settlement). However, an exemption is made for Mainland Chinese passport holders who are transiting through Hong Kong to a third country. In this case, a visa waiver is available for those whose stay in Hong Kong lasts a maximum of 7 days and who can prove their onward journey. Non-Chinese nationals living in other parts of the PRC are treated on the basis of their nationality, whilst Chinese nationals living in other parts of China who do not possess the right of abode in Hong Kong are treated based on the region in which they have a right of abode or household registration. The venue, the Hong Kong Polytechnic University (PolyU), is located in Hung Hom. In nearby Tsim Sha Tsui East, accommodation catering to every budget is available, such as a variety of hotels and hostels that only take you less than 10 minuted walking. In Tsim Sha Tsui East, next to the venue, are most of high-end hotels. There are a few more 5 star hotels closer to the Tsim Sha Tsui ferry pier, in Ocean Terminal and Harbour City. Here are some more high-end hotels which marked at more than 125 USD (~1,000 HKD) per night. The prices in this list had already include an "early-bird" discount for booking, although we will try to get better price if our bid is successful. There also diffent hostels and budget hotels, locally referred as "Guesthouses", scattered all over the Kowloon peninsula, and most of them are located in nearby Tsim Shui Tsui & Jordan, and a few in Hong Hum. Here is short list that included some hotels which priced around 40 USD for one night. This is an average cost for a twin-room with two separate beds for one night to each person. Besides that, most of the hotels and hostels located in Kowloon Peninsula would only take you within 30 minutes to the Hong Kong Polytechnic University by public transport. We are also seeking a summer booking of the Student Halls of Residence (SHR) of the PolyU itself, which can accommodate 3000 guests in full capacity, and other possible hostel option in downtown Kowloon. The SHR provides accommodation for guests with rooms are designed for double occupancy. Every two adjoining rooms form a self-contained unit, sharing a toilet and shower room. For further information regards with facilities provide, please refer to the website of the Student Halls of Residence of PolyU. Hong Kong has a highly developed and sophisticated transport network, encompassing both public and private transport. Over 90% of the daily journeys are on public transport, making it the highest rate in the world. Hong Kong also possesses one of the safest, also cheapest, transportation networks amongst most of the major cities in the world. Therefore unlike many large cities where security and crime on public transportation is always criticized and projects a negative reputation towards visitors, Hong Kong has a high positive reputation of a safe, clean and accessible system, where travellers can always be confident of safety and economical journeys. Hong Kong also was one of the first cities to apply, and is currently the city with the most advanced use of smartcards as electronic payment, especially on public transport. Once in Hong Kong, the most convenient way to pay the fares while travelling around is by Octopus Card, available from any MTR station or one of the thousands of convenient stores and shops around the city. "Added value" (top-up) services are also available at any of these locations. Incidentally, the Octopus Card is also widely accepted means of payment for everyday goods in convenience stores and food outlets. Due to the extensiveness and complexity of the transport infrastructure, often a same journey may be served by different modes of transportation and at different cost; similar while different routes may also be seen from the network. Customer service centres at MTR stations and major termini provide assistance or advice. One of the typical stations on MTR system. The iconic red-circled symbol is the logo of the network and follow them tells you where's the station are. First Bus may be recognised by livery of white and orange body with a green-stripe on-top. MTR: As can be gleaned from its full name – Mass Transit Railway is currently the metro-train services operator of Hong Kong. It provides a convenient, network-extensive, and primarily the most efficient mode of transportation for travelling across different districts of Hong Kong. Fares vary according to the travelling distance and districts, and may ranges from approximately HK$3.50 (one stop); HK$10 (cross harbour); HK$35 (cross-border). All metro stations are accessible with franchised bus services, and some, although Airport express is provided by MTR system (but in a relatively higher fare than buses), are accessible with Airport buses. If you're travelling Airport Express with associating a connection with another MTR routes a discounted fare is included on that particular connection journey. Hong Kong Station, as the terminus of Airport Express, located in the heart and the business financial centre of the city – Central. Kowloon Station is also reachable by local buses and walking distance from Jordan area. In-town check-in services and feeder buses between major hotels within urban areas and Hong Kong/Kowloon Station is provided and they're complimentary for passengers who're travelling with Airport Express from/towards these two stations. A journey between Airport and Hong Kong Station takes about 24 minutes. All MTR stations (as shown on the map above); convenience stores and ATM are available at most stations. MTR also operates a series of local feeder bus routes (mostly beginning as K -prefix) in the suburbs of the New Territories including Tuen Mun – Yuen Long region and Tai Po aimed to connect local areas to its railway network; fare discounts may be provided on travelling them with associating a light rail or mainline rail connection. Buses: Buses in Hong Kong are franchised, and there are currently five franchised bus companies in Hong Kong. Harbour-crossing routes are jointly-operated by two bus franchises. Route numbering is based on the types of route and the districts where they serve. Bus routes in Kowloon Peninsula and New Territories share one numbering system. While the whole Hong Kong Island has another numbering system. Corresponding routes of same number are completely independent of each other. Harbour Crossing and Airport routes however, are using a same numbering system throughout Hong Kong. Routes with a 100, 600 or 900 prefix are harbour-crossing. Kowloon Motor Bus, branded as KMB, one of the largest privately-owned bus companies in the world, also the dominant operator in routes of Kowloon Peninsula and New Territories. It has a second highest market share among all transportation in Hong Kong, behind MTR. Unique design on red-coloured circular-shape routes indication over their bus stops is a symbolic characteristic of KMB. Common type of transportation if you're moving around Kowloon and New Territories. Long Win Bus, one of the airport bus operators. Unlike Citybus it has a independent franchise on its airport buses service while it has a heavy correspondence with KMB – its mother company. Routes mainly serves between New Territories and Airports, as well as Tung Chung – the supporting town of the Airport. Company and route details of both Long Win Bus and Kowloon Motor Bus may be found in a same website as KMB.com. Citybus and New World First Bus are the two main bus companies in the Hong Kong Island, and share common control. They operate several crucial bus routes which link some city centre regions of Hong Kong Islands with various destination in Kowloon and the New Territories. Citybus has a relatively denser network on some trunk routes, while NWFB concentrates on local networks on Hong Kong Islands. New Lantao Bus is the primary operator of local bus service within the Lantau Island. its service especially focused on the routes covering the southern region of Lantau since the road network of the area are restricted for access. During holiday vacations and weekend leisure activity they're widely used by either local citizen or tourists on accessing some of the major tourist spot and leisure countryside area on the island, such as Tai O and Mui Wo. Services also available in weekdays however trip fares are generally higher during weekends. Trams: Established in 1904, it is one of the oldest tramways in the world which remains operation today, especially majority of its track is still following as a same alignment since it was built. Also along with the Blackpool Tram in Britain, it is the only place in the world with double-decker trams in operation. Therefore the tramway itself, not act as only a mode of everyday transportation but also possesses a tourism value while travelling them. The main tramway roughly follows the coastline of Hong Kong Island of a century ago. Its route stretches from the western Praya once known as 'Victoria City', whereas both Europeans and Chinese concentrated respectively in the past, traverses the central business district and terminates in Shau Kei Wan to the east. Fares are very cheap, a single journey flat fare is charged regardless of the distance traveled: HK$2.30 for adult, HK$1.20 for children and HK$1 elderly. Although travel by tram is generally slower, the tram is very cheap compared with most cities, and compared with parallel routes which may be reached by using buses or MTR. Ferry: These may mainly be divided into the following three types of services according to their characteristics. Harbour-Crossing routes are the ferries services which travel between Hong Kong Island and Kowloon by crossing the Victoria Harbour. One of the services regarded as such is the distinctive and well-known Star Ferry which serves between Tsim Sha Tsui and Central or Wan Chai of Hong Kong Island and is often advertised as one of the 50th must-see sightseeing spots over the globe by the National Geographic, as well as numerous of travelling publications. Hong Kong has a significant numbers of small outlying islands in its territory and ferry services often becomes a dominant, if not the only, transportation mode for these islands, as well as travelling to South Lantau in a more direct routing from the urban. Some islands are especially populated or popular for tourism are well served by frequent ferry services, for example Cheung Chau and Lamma Island as famous local countryside spot and resorts. Most of the services in such type departs from the Central Piers – The transportation hub of domestic ferry services in Hong Kong. Some relatively smaller ferry services serve remote islands, or countryside area which may not accessible by road. These are however operated by local operators and service detail and schedule may vary. Taxis: The service area of taxicabs in Hong Kong are divided into three parts by the Government, which is regarded as Urban Taxi, New Territories Taxi and Lantau Taxi, the scheme is designed to avoid clustering of taxis into the most populated or profitable areas in the territory. Urban Taxi: Visitors to Hong Kong are most likely to come into contact only with urban taxis, which are licensed to serve all the territory, mostly Kowloon & Hong Kong Island; pick-up on Terminal 1 &2, Ground Transportation Centre of the Airport, Tung Chung, Disney Resort and New Territories if passengers on-board are returning to Kowloon or HK Island, vice versa if passengers are going to the destinations above departed from Kowloon or HK Island. A tip for crossing the Harbour: try to hire a taxi at a harbour-crossing taxi stand where passenger only pays the one-way tunnel toll, instead of twice from ordinary street taxis and 'normal' stands. New Territories Taxi (green) and Lantau Taxi (blue): As their names imply, these taxis serve most of the New Territories and Lantau respectively. Their fares are lower but are not allowed to serve within designated urban areas, even if the journeys originate within their catchment areas. Further information on fares, additional charges and by-laws (e.g luggages, tolls) is available on the websites of the Hong Kong Tourism Board, and the Transport Department. The venue is adjacent to Tsim Sha Tsui (尖沙咀), where is the most popular hang out of the locals, with many shopping malls, gourmet, bars, cafés and cultural experiences. Also close by in Jordan (佐敦), the neighborhood just north to Tsim Shui Tsui, you can also find a lot of rather local gourmet fare. Kowloon Waterfront, offers splendid views of the Hong Kong island shore and skyline. This is the best place to experience the classic view of Hong Kong, and nobody on their first trip here should miss out on promenading along the waterfront. The best views are to be had at night when the lights of global capitalism provide a powerful spectacle. Every night at 8 pm there is a colourful light show, called "A Symphony Of Lights", that is staged atop the key buildings on both sides of the harbour. Nathan Rd is the main artery of Kowloon peninsula, where shows you a typical Hong Kong urban landscape, a chaotic mix of skyscrapers and Cantonese style old buildings, of merchandising stores and residential buildings, where you can even see an Anglican Church within such mix. Once referred "Golden mile" of Hong Kong, streets lined with a chaotic array of neon signs hanging from the building are world famous. It is also a major shopping strip for both locals and visitors, with all kinds of small stores to huge department store for everyday needs. Tsim Sha Tsui also is a major shopping area for locals & visitors with a number of major Shopping Malls in the area. You can find most of the world-famous luxury brands in these mall, although they are most frequented by tourists from Mainland China. Knutsford Terrace, near the Miramar hotel is perhaps best described as the 'Lang Kwai Fong' of Kowloon, and has a large number of bars and restaurants of variable quality that cater for mid-range budgets. A little smaller and less frenetic than Lan Kwai Fong, but this narrow street is also a popular meeting place on a Saturday evening. Ashley Road, between Nathan Road and the Ocean Terminal shopping mall, features many Western restaurants and bars. You can find a variety of gourmets in Carnarvon Road & Lock Rd, where locals go there to feed themselves, from Cantonese Cha chaan teng to French cuisine, Teochow rice noodle to Indian curries even Turkish kebab. Take a walk in Kowloon Park where you will find not only pleasant gardens but aviaries, museums, and sporting facilities including Hong Kong's best swimming pool complex which offers both indoor and outdoor pools. The main pool with lane swimming in the lush-green setting is complemented by a wide-range of swimming, diving and children's play-pools appealing to adults and children alike. Temple Street south of Mong Kok is a great place to eat Chinese street food. Temple Street, famously featured in Chinese cinema, is one of the few pedestrianised streets in Kowloon where you can sit, relax and watch the world pass by. Seafood is a popular choice, but most restaurants will provide you with an extensive English/Chinese menu that caters for most tastes. Frog is a tasty option, or try the oyster omelettes. Parkes St is another area you can find variety of gourmets, including Cantonese, Shanghainese, Japanese, Korean, Vietnamese, Taiwanese, Thai cuisines. A small shop named Australia Dairy Company is total reflection of Hong Kong efficiency, as each guest has only 10 minutes to enjoy their dairy desserts. The immediate area northwest of Jordan Rd and Nathan Rd in Jordan contains a kaleidoscope of cultures and people from India, Laos, Cambodia and other Southeast Asian nations. Many of them have opened restaurants with authentic cuisine of an international flavour. There are also street restaurants offering Chinese-style seafood, where you can closely view fish, shrimp or crab before being slaughtered for your order. Although the neighbourhood looks run down, it is safe and filled with pedestrian and vehicular traffic almost around-the-clock. At night, you'll likely get solicited for patronage by restaurant employees. If you would like to go further, you can either take East Rail Line to Mong Kok East from Hung Hum Station, or take buses to different hang-outs on the Hong Kong Island, from the Cross Harbour Tunnel Bus Terminus. Both the train station and the bus terminus are next to our venue, PolyU. Mong Kok (旺角) has a huge choice of shops and markets in an area of less than a square kilometre. You can also find many Cafés, and gourmets from local street food, to high end Western dishes. It is also a rather local hangout, where you can find clothes, sports shoes, electronic gadget and karaoke. Visitors may find Tong Choi St & Fa Yuen St interesting, as they are the few remaining street market in the territories. Wan Chai (灣仔) is much more than a couple of blocks of girlie-bars populated by drunken American sailors; after all, the World of Suzie Wong was just a work of fiction set in Wan Chai during a bygone age. Located between Causeway Bay and Admiralty, Wanchai has an inner-city feel that makes it an interesting but safe area to walk around at any time. Wan Chai has traditional street markets that, unlike many other neighbourhoods, are still outdoors. In the so-called wet-markets, butchers hang animal carcasses on large hooks that overshadow pavements and fishmongers have stalls with live fish that do their best to escape. Between Johnston Road and Queen's Road East are numerous alleys that are worth exploring if you are looking for traditional family-run shops selling anything from tropical fish to cheap clothing. Central (中環), previously known as Victoria, this is 'downtown' Hong Kong and maybe defined as the area within walking distance of Central MTR station. Head north towards the harbour and you will find modern buildings such as the IFC shopping mall. Alternatively, make your way uphill towards the mountain and you will encounter some of the oldest parts of Hong Kong. Lan Kwai Fong (蘭桂坊) , a small area just southwest of Central Station focussed on the L-shaped street of Lan Kwai Fong and also including parts of D'Aguilar Street, Wellington Street and Wyndham Street forming a square around Lan Kwai Fong. The area is packed with restaurants, bars and clubs. Popular with expatriates and local customers. Soho (蘇豪美食區), an entertainment zone between Hollywood Road and Bonham Road–Caine Road, besides restaurants, bars and clubs, the area also features galleries and shops. Take the elevated walkway from the IFC mall to catch the escalator up. Victoria Peak (山頂) a high class neighbourhood and popular tourist destination that looks down on Central and Victoria Harbour. Causeway Bay (銅鑼灣), shopping district that is home to large department stores, such as Sogo. Causeway Bay is one of the most densely populated areas of Hong Kong, crowded most of the time, but here you can eat and shop until very late. Some major supermarkets and eateries stay open 24 hours. Times Square in Causeway Bay is a major focal point, especially at the 'calendar' New Year when you will be wise to stay away if you hate crowds. The area is also popular among Hong Kong's youth and is a good place to observe the latest fashion trends. The proposed conference venue is next to East Tsim Sha Tsui, Hong Kong's museum district with a four major museums and other cultural venues along the promenade. We hope that this geographical proximity may boost our efforts in WP:GLAM outreach! A one-week museum pass for all exhibitions in these museums are available for HK$30 (US$4, €3, £3). Hong Kong Science Museum. Large museum with many interactive exhibits including a energy machine and an airplane. A museum which decided to make an architectural statement about its purpose, yet somehow got it horribly wrong. Although primarily aimed at children, museum-savvy adults will also certainly find an amazing time playing with the exhibits. The maths puzzles and optical illusions on the top floor are challenging. The museum hosts the world's biggest energy machine which spans the entire museum and runs for a few minutes every two hours. Hong Kong Museum of History. A history museum in its conventional sense, but better. Experience the Hong Kong Story and forget the idea that all of Hong Kong museums are frumpy and boring. The Hong Kong Story is a real must go and do, ideal for those who want to make sense of Hong Kong's vibrant past in a way that is engaging and interactive. Allow at least two hours for your visit. Special exhibitions are also available, usually covering a specific era in the history of Hong Kong. Hong Kong Museum of Art. The national gallery of Hong Kong, the Museum of Art hosts permanent and temporal exhibitions of paintings, calligraphy, pottery and other artistic artifacts from both local artists, China, and the West. Hong Kong Space Museum. Affectionately known as "the egg" by locals, the museum has the oldest planetarium cinema (hence "the egg") in Hong Kong, long before the days of IMAX. It also houses a permanent exhibition on astronomy. Hong Kong Cultural Centre. The Cultural Centre is the prime theatre and concert location in Hong Kong, and is the home concert hall of the Hong Kong Philharmonic Orchestra. Despite its peculiar exterior shape, the architecture has created a superb indoor space that is ideal for the sights and sounds of each performance. Its comfortable atmosphere and clean, free lavatories made it a hotspot for locals and tourists alike. Hong Kong has consulates general for more than 50 nations, some even are the ones of the largest diplomatic mission in the region. Only consulates-general are listed here (in case of the Portugese Republic, whose CG is located in Macau), there are some nations are represented by Honourary Consuls, please refer to the information on Website of HK Government's Protocol Division. Macau, the former Portuguese colony and present largest gambling haven in the world, is just an hour away by TurboJet ferry. It was the first European enclave in East Asia, and a major trading port from its founding in the 1500s. Today its main attractions are casinos, European food and wine, and old colonial buildings. Ticket prices start at $18 for the one-hour ride to Macau. The ferry building is near the Sheung Wan MTR station on Hong Kong Island. Less frequent ferries are also available from New World First Ferry in Tsim Sha Tsui, Kowloon and the Hong Kong International Airport. Shenzhen, mainland China's boomtown just across the border can be reached by MTR train services in about 40 minutes. The train is convenient if you are keen on shopping as it terminates in the Lo Wu commercial centre. Another alternative, especially if you are starting from the island is the ferry to Shekou which takes around 50 minutes and costs around $13. Note that if you are not a Hong Kong resident, Japanese nor Singaporean citizen, you will need to pre-arrange a general PRC visa to enter Shenzhen prior to arriving in Hong Kong, or through China Travel Service once in town. Guangzhou, capital of mainland China's Guangdong Province, which was known as Canton in the tea-clipper era. Guangzhou is thousands of years old and has always been the most important city of Southern China. 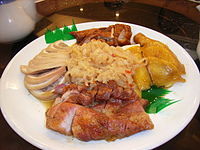 It is also considered the root of the Cantonese culture in Hong Kong, Macau and all over the world. Guangzhou can be reached by train within 1 hour 30 minutes to 2 hours, depending on Guangdong Line. If you are on a budget, many cross border buses are available throughout Hong Kong. The trip will take more than 3 hours, including going through customs at the border and changing buses. Check bus schedules and fares online. Guilin and Yangshuo for famous mountain and river scenery, possibly returning via Southern China's greatest city, Guangzhou. Wu Yi Mountain for history and scenery, returning via the lively modern city Xiamen. Yunnan a very popular tourist destination, home to many of China's minority ethnic groups and the self-proclaimed Shangri-La County. Meals $94,458.76 $733,000.00 Includes a light breakfast and lunch, as well as coffee breaks. Accommodations for VIPs $5,154.64 $40,000.00 For out-of-town VIPs. Scholarships $51,546.39 $400,000.00 A "full ride" to Wikimania for someone outside the continent. Promotional materials & supplies $12,242.27 $95,000.00 Includes t-shirts. DotAsia, the sponsoring organization and registry operator of the .asia top-level domain, has agreed to be a co-organizer and sponsor of Wikimania 2013 in Hong Kong. DotAsia was a sponsor of Wikimania 2007 in Taipei, and has a long-standing working partnership with Wikimedia Hong Kong in conference organization, in particular the Asia Pacific Regional Internet Conference on Operational Technologies (APRICOT) and the Regional Internet Governance Forum (RIGF). Through DotAsia, Wikimedia Hong Kong is currently approaching past sponsors of APRICOT and RIGF for further sponsorship opportunities. The Chapter is also in touch with relevant government department to ask for support. So far the responses have been positive, and Mr Greg So, the Secretary for Commerce and Economic Development of the HKSAR government, had already signed and sent us a letter of support to Hong Kong's Bid. As one of the world's leading international financial centres, Hong Kong is home to many of Asia's biggest media players. The loose regulation over the establishment of a newspaper makes Hong Kong home to many international media such as Asian Wall Street Journal and FEER, and a number of prominent international broadcasters with studios & offices in Hong Kong, including CNN & Bloomberg, or at least correspondents in Hong Kong covers local affairs and events in the nearby region. With one of the world's largest press industries Hong Kong is also a major centre for print journalism. By 2009, 4.3 million Hong Kong residents were online, a penetration rate of nearly 70% (official statistics), and new media & social media is popular and vibrant in the town. Social media & Internet related events are celebrated all around the year in the City, including Web-Wednesdays and Barcamp. From the experience of previous Chinese Wikimedia Conference the local commercial print media, that would be interested in covering various aspects of this event. A new trend that is different from the situation in 2006, for Hong Kong print media is free newspapers, and most of which belongs to a group with a paid newspaper, are more and more popular. 2 broadcast television networks, ATV and TVB, and several subscription networks are available for the public in Hong Kong, and most of them are produced and broadcasted in a digital television format. All the networks have extensive local news broadcasts, and some with a 24/7 channel dedicated on real-time news programs. Some of them are particularly broadcasts in public transports and open spaces such as shopping arcade. The public broadcaster RTHK also produced current affairs program, though without her own channels, the program had to broadcast via the networks. Hong Kong is home to a variety of radio stations that offer programming in Cantonese & English, and a few in languages of different ethnic groups in the territories. Aside from local AM and FM radio channels, online radio is also booming. The Wikimania conference has been covered nearly every year by the New York Times, and we anticipate that coverage by these major media from all around the world would increase were the 2013 conference to be held in Hong Kong, because of most of these media have their own correspondent in Hong Kong all the time. Experience from previous Chinese Wikimedia Conference also tell us, such international event will bring local media coverage as well, and a number of them are constantly in touch with the Communication Commission of the Hong Kong Chapter. Keynote speakers of high caliber will also help to bring in additional media interest, and the bid team is prepared to coordinate media engagement throughout the event, as a number of volunteers are actually working within the media sector or under professional journalism training. The Hong Kong dollar (港幣 or HKD) is the territory's official currency and is the unit of currency used throughout this travel guide. In Chinese, one dollar is known formally as the yuen (元) and colloquially as the men (蚊) in Cantonese. You can safely assume that the '$' sign used in the territory refers to HKD unless it includes other initials (e.g. US$ to stand for US Dollar). The HKD is also widely accepted in Macau in lieu of their home currency at a 1:1 rate. Currency exchange desks are available at airport, as well as at most banks. Australian Dollar, Canadian Dollar, Renminbi, Euro, Indian Rupee, Japanese Yen, Macau Pataca, Malaysian Ringgit, New Zealand Dollar, Singaporean Dollar, South African Rand, South Korean Won, Swiss Franc, Taiwanese Dollar, Thai Baht, Pound Sterling & US Dollar are all widely exchanged. Automated Teller Machines (ATM's) are common in urban areas. They usually accept VISA, MasterCard, and to certain degree UnionPay. Maestro and Cirrus cards are widely accepted also. They dispense $100, $500 or rarely $1000 notes depending on the request. Credit card use is common in most shops for major purchases. Most retailers accept VISA and MasterCard, and some accept American Express as well. Maestro debit cards however are not widely accepted by retailers. Signs with the logo of different credit cards are usually displayed at the door to indicate which cards are accepted. The Octopus card (八達通, "bat dat tung" in Cantonese) provides instant electronic access to Hong Kong's public transport system. As the world's first contactless smart debit card, it can be tapped onto a reader to transfer fare from the passenger to the carrier. It is similar to Singapore's eZ-Link card, London Underground's Oyster card and Japan Railway's IC card. In addition to being used for all forms of public transport (except most of the red-top minibuses and taxis), Octopus is accepted for payment in almost all convenience stores, restaurant chains like McDonald's and Cafe de Coral, many vending machines, all roadside parking and some car parks. There is variety of dining from the budget to the gastronomic, from McDonalds to Joel Robuchon, from Mak's Noodle to the reknowned Yung Kee. As with local-style Tea restaurant, "Yum cha" could be a valuable and exotic dining experience. There are many coffee shop and Cafe in Hong Kong, therefore you can enjoy a cup of brew at anywhere. Beside that, there are many take-away beverage store selling Taiwanese flavored tea. No matter where you are, having a drink could never be a problem. For an access to commercial Wifi hot-spots mainly provided by PCCW and Y5ZONE, with whom one week of unlimited usage costs $9 (Nov 2011). Those companies also have daily, weekly and monthly plan ($20 and $13 per month for PCCW and Y5ZONE, respectively). Some restaurants such as McDonald's and café as Starbucks provide 20 minutes of free WIFI access provided by Y5ZONE. Most hotels these days, even down market ones, provide Wi-Fi access in their lobbies to their guests. Free wifi may also be available in some shopping malls and the airport. There are also some fixed internet terminals at the airport and in a number of MTR stations. Citybus and NWFB also provide free wifi service on some of their buses, notably the Cityflyer, the service run by Citybus which connects the downtown Hong Kong Island & Kowloon with the Airport. The government also offers a big network of free WIFI  hot spots in most government premises and public libraries. 3G-enabled phone users can choose a temporary 3G plan from different operators. Some operators, offer an unlimited 3G access for a week at a reasonable price. Any of the city's [five] mobile operators has branded shops where such SIM cards are sold without requirement for registration. The weather in Hong Kong is hot and humid in August. However, the venue is well air-conditioned for participants' comfort. Also, our party is held on the beach so anyone who wanted to cool down oneself can have a dip into the sea. For the same reason, the event is held at a unified venue where most of the walkways and passages are indoors, and accommodation is nearby. This will minimize discomfort due to the sub-tropical weather. Although typhoons affect Hong Kong, actual damages are usually minor. In the case of adverse weather conditions, special arrangements will be made to maintain the programme of the event within the venue. The cost of this event can be high. However, we are a charity and we can utilize such status to gain waivers and better prices. Also, many sponsors are willing to provide in-kind sponsorship which would help us lower the cost. Accommodation fee is rather high in the area surrounding the venue. Therefore, once our bid is successful we will reserve a block of rooms in the hotels and hostels which would lower the accommodation cost. Hong Kong is geographically from Europe and the Americas, where many past Wikimania participants come from, and travel costs may therefore be expensive. Fortunately, Hong Kong is also very well-connected to most parts of the world by air travel (see #Getting to Hong Kong), and we are trying to obtain air-fare discounts for Wikimania participants. We believe that rotation of location is important to Wikimania, which has not been held in the Asia-Pacific region since 2007. By hosting Wikimania 2013 in Hong Kong, we hope to bring in Wikimedians from East and Southeast Asia, and encourage the growth of Wikimedian communities in the region. Air pollution has been getting notorious year by year in Hong Kong due to economic development in both Hong Kong and mainland China and local vehicular traffic growth. It gets rather bad during winter when northerly winds worsen the air quality in Hong Kong in winter, making the air quality rather hazardous. However, Wikimania 2013 is planned to be held in summer, which the prevailing wind is easterly and southerly winds from the South China Sea. Also, most of the conference is held indoors which would be climate controlled so any adverse effects of outdoor air quality will be lessen. Our main party would be held in the countryside by the sea which would also have cleaner air. Hong Kong International Airport can be accessed by direct flights from most major cities. The airport is connected to the downtown, as well as the venue, by reliable public transport including buses and the MTR. Also, visitors from most countries can come to Hong Kong visa-free. The venue, the Hong Kong Polytechnic University, is located near the Tsim Sha Tsui area, which is the transportation hub in Kowloon downtown, and has many sightseeing spots. We also hope to attract Wikipedians in China. Although it is difficult for mainland Chinese to get the visas for foreign countries, an entry permit to Hong Kong is more easily obtained. Therefore, having Wikimania in Hong Kong makes a good opportunity for Chinese Wikipedians to attend. Hong Kong is believed to be one of the safest cities in the world. According to the figures from the Hong Kong Police, the crime rate is much less than other major cities. The chance for Hong Kong being threatened by terrorism is low compared to many other world cities. The freedom of press in Hong Kong is one of the highest in Asia. As there is no internet censorship, information can be accessed and published freely in Hong Kong. Internet can be easily accessed anywhere with blanket 3G coverage and unlimited wifi services available. Wifi is available in the Wikimania venue, and free unlimited wifi services are available in many other places in Hong Kong. Other wifi services are also provided with a very low cost as illustrated above. Asia-Pacific headquarters of many multinational companies are located in Hong Kong. Many local companies have developed from Hong Kong to Asia-Pacific and even the whole world. Having Wikimania in Hong Kong will develop links between the Wikimedia movement and these companies, and providing more opportunities for cooperation, bringing sponsorship to the Wikimania itself. Compared to other countries with similar economic standards, cost of items such as transport and food is relatively affordable. Hong Kong is good for shopping as most of items are tax-free, even wine and cosmetics. The majority of the accommodation will be arranged in the area of Tsim Sha Tsui, Jordan and Hung Hom, where there are plenty of 24-hour restaurants and convenience stores. Buses and mini-buses provide overnight services so visitors can always regain their hotels at all hours. As a regional transportation hub in China, as well as in Asia, visitors can easily transfer to nearby destinations such as Macau, mainland China, Taiwan and the rest of South East Asia – a short ride on land, by ferry or a short flight. Hong Kong has a long-standing and energetic Wikipedian community which meets every month. Our experience in organizing the Chinese Wikimedia Conference 2006 in Hong Kong and in 2009 in Macau will be a key success factor of the conference if held in this city. Government has given vocal support (as proved from the letter of support above) and we are discussing with several departments for further collaboration. Parts of the page was adapted from relevant pages from Wikitravel, which are based on work by Claus Hansen, Martin Cox, Samuel Chan, Edison Chua and Bill Ellett, Wikitravel user(s) Globe-trotter, Timeo and Sumone10154, and anonymous editors, released under cc-by-sa 3.0 licence.